Is locally owned and operated. 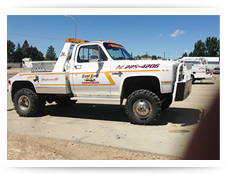 We specialize in towing, but also provide roadside assistance, used vehicle parts and vehicle repair services from our location in Dickinson, ND. Our company carries the right insurance, certification, bonding and licensing to let you know that you are dealing with a reliable company that protects you. East End provides towing services 24/7 year round. 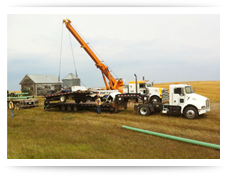 We tow from the smallest of vehicles to large semi-trucks. No job is too small or large for us to handle. We provide a full explanation of these services on our Services page. Our company also offers roadside assistance for those times when you break down on the side of the road. East End additionally offers a wide assortment of used vehicle parts. If we happen not to have your particular part in stock, our professionals will search through the computerized nationwide database of parts to locate the exact part you need. We work with numerous suppliers to gain access to parts for domestic and foreign cars and trucks. We have grown over the years to the extent that we recently expanded our shop. 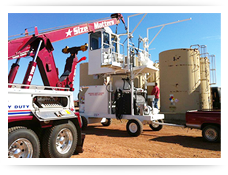 After this expansion, we can serve your needs for vehicle towing and repair with added efficiency. We strive to keep your car running as smooth as possible with our regular maintenance services, but we also desire to help you in those times of major repairs such as your transmission needing special attention. Our goal is to provide you with reliable towing and other services on your vehicle. We guarantee all of our services. Your satisfaction is of utmost importance to us no matter what service we happen to provide you. Call us today for a quote or further information on any of our towing and other services. We will answer any questions you may ask to the best of our ability. Our staff, drivers and technicians are eager to meet and even exceed your expectations for the quality we provide. Discover today how personable and reliable our service is for you.